Do you love romantic settings with sparkling crystals and light reflections bouncing off each other, creating almost a wonderland – like atmosphere? This economical, easy to prepare, yet gorgeous wedding reception lighting arrangement is all about playing with light and taking advantage of the surrounding objects to be part of a spectacular natural light performance. On the tables we have scented candles inside tea light glasses providing soft, animated ambience with the added warmth from the burning flames. 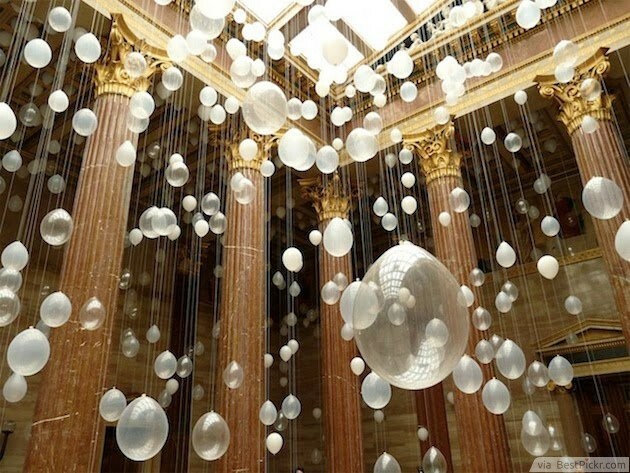 Up top, there is illusion that you are surrounded by chandeliers instead of light bulbs and tea lights inside glass spheres that hang from the trees. The double layer of illumination not only brings out all the beautiful contrasts of flowers and glasses, they also emanate warmth and help to keep the temperature distributed evenly in cold winter nights so that your guests can enjoy the comfort of being indoor all the while indulging in the mesmerizing outdoor setup. This stunning and brilliant pendant light idea not only looks totally cool and impressive to your guests, it's also water proof so no fear of rain pouring down and ruining your happy party night. 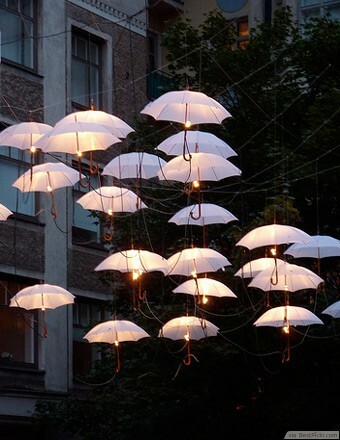 All you need is a good collection of small size umbrellas (works especially well with vintage looking items), hook the wires up and pull them through the umbrella handles to connect to the light bulbs. When all is assembled, simply hang these umbrella pendant lights into nested wires (they will become invisible in the darkness in the evening). And there you go, a magical, romantic and amazingly beautiful outdoor pendant lighting set up to turn any outdoor space into a full blown decorative party. Great for cocktail parties or best for any outdoor social events that you are not sure about the weather, or when it's windy and traditional means of illumination is out of question, such as flame candles. Great for Halloween, or when you need to add that little touch of spookiness, or just something out of the ordinary, resembling the glowing spider web during the night. 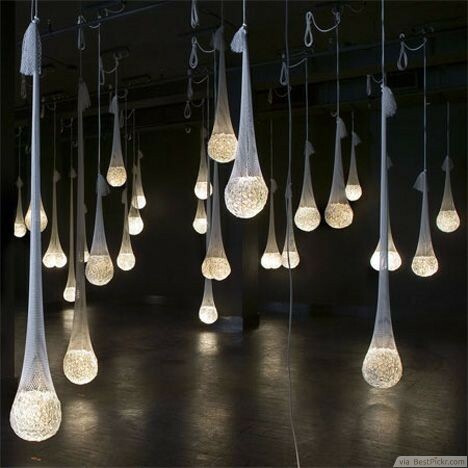 To make this creative cheap pendant lighting decoration, simply use second hand white stockings with glowing in the dark balls, or a hidden lamp inside and hang then to the ceiling or trees. Works spectacular for theaters, prop setups or photo studios to create that magical feeling of being lost in the forest full of light wisps and fairy creatures. The playful and charming beauty of this outdoor sting lighting design is pretty much self explanatory. Though it requires some work and a bit of electric diy skills, if you have a man in the house, this should be a piece of cake. The whole idea behind this hanging pendant lights is creating a special ambiance to your outdoor backward, deck, garden or winery experience. 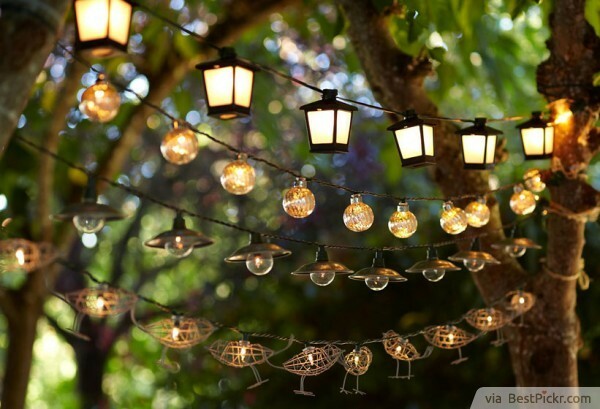 Whether it's lanterns, crystal balls, or Christmas string lights covered with hand made birds out of wires, choose the one that perfectly compliments the mood you desire, such as playfulness, intimate feeling or simply a relaxed and warm summer night atmosphere. Your creativity is what will make this pendant track lighting set up unique and personalized. Try mixing and paying around with many designs. For example, replacing tiki torches with flameless candles is a great idea to try, as they are safe to handle even with kids hanging around, and the same time create that mysterious touch to any settings. It is perfect for any party occasion for kids and adults, especially for indoor decoration, or even as a permanent interior design solution to enhance your home. It's very inexpensive and easy to make, while still looking unique and elegant for your living room or office. You can even color the spoons to any color of your choice to produce either warm or cool light. Adult supervision is recommended for this homemade spoon lamp project. Wow your friends with these interesting miniature moons floating in the air with very soft glows of light, just enough to illuminate your Halloween costume or Easter holiday parties. 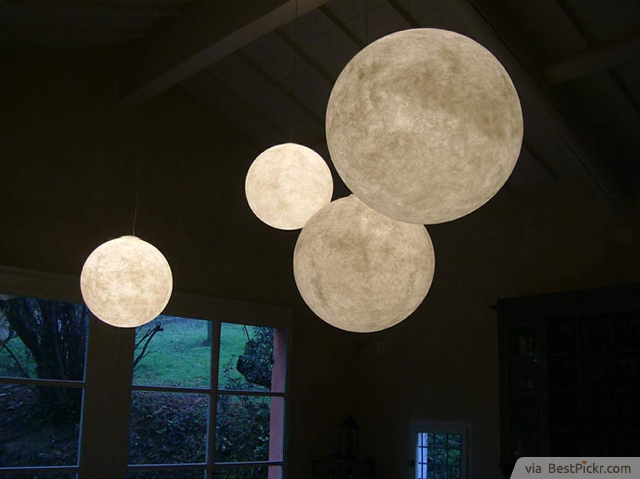 These lunar globe lighting fixtures can be hanged indoor as well, but for the best impact, an outdoor layout during calm, dry and not so windy days is recommended. First, blow the balloons to the sizes you want and tighten them. Dip the papyrus paper into glue solution mixed with water at 50/50 ratio. Then tear apart these sheets of paper into narrow strips around 1 inch wide (2.5cm wide). After that lay these wet strips around your blown balloon to cover its surface, leaving only a hole just big enough to push the light bulb through later on, as shown in the picture to the right (which uses hemp strings instead of papyrus paper, but the principle is similar). Leave your moon globe to dry completely (usually takes about 24 to 48 hrs) and you have the papyrus paper already turned into hard mold in the sphere shape of the balloon. Carefully release the air out the balloon and take it out and there you have a Luna globe ready for your Moon pendant lights show. Just be gentle with handling - these paper globes are very fragile. Nothings feels more magical and uplifting than these sparkling, glowing crystal bubbles up in the air. 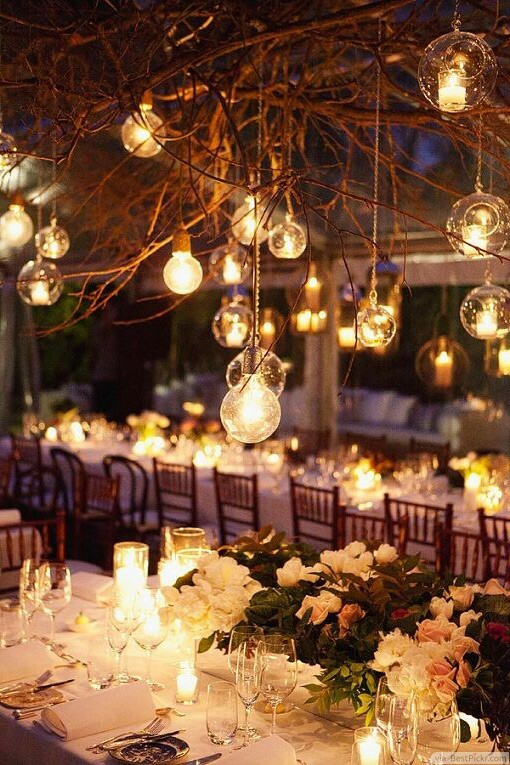 Whether you are looking for a cute dating idea, a lovely wedding anniversary inspiration, or something special and unforgettable for the 18th birthday party in the garden, these mystical orbs will provide that beautiful and romantic touch to the evening. 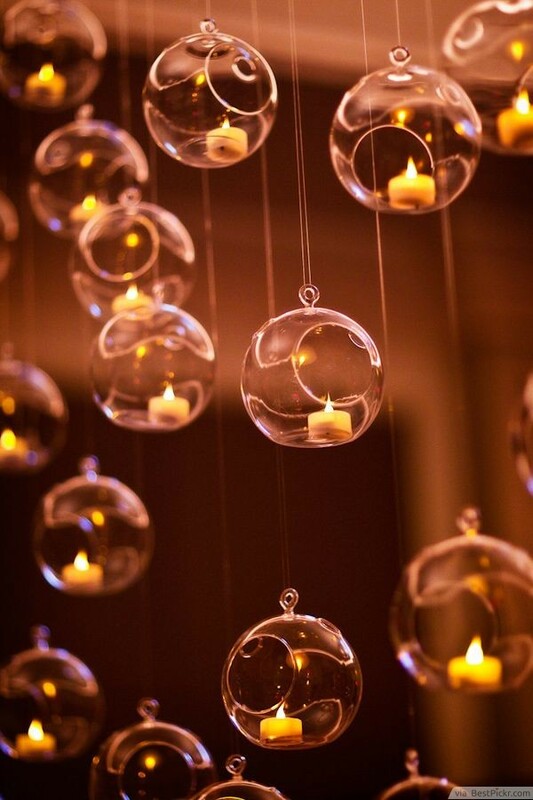 Best of all, you don't have to be a diy genius with any talent for craft to obtain these gorgeous tea light hanging glass orbs, for they can be bought quite cheaply for less than the price of a cup of coffee each. Festival entertainment is surely something most guests would welcome wholeheartedly. 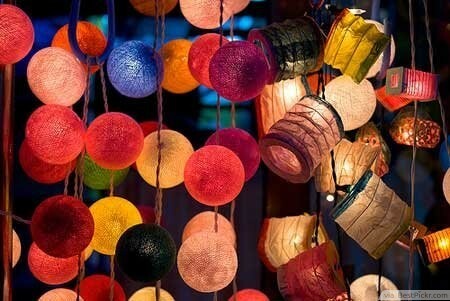 And you can re-create that fun and exciting aura with these fabulous Chinese lanterns, great for Christmas, Thanks Giving, wedding, or birthday celebration. What's very interesting about this setup is that it's very safe to operate with cool battery powered lights, which are also extremely versatile for a variety of setups and atmospheric conditions. Whether it's warm cozy indoor event or windy and rainy outdoor wedding reception, these hanging lanterns provide just the right amount of illumination, in any color of your choice to create the desired mood. You can get the paper LED battery lanterns ready made or just the battery terminal lamp for lanterns separately. 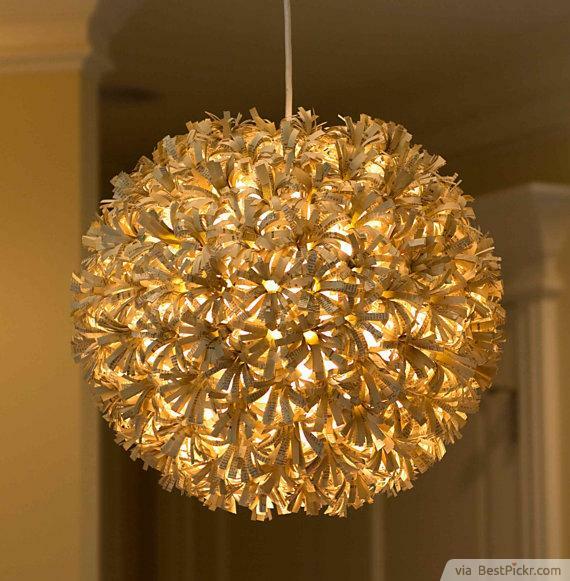 Called "Sidney Pendant Light" balls – this is something you can actually buy 100% handmade by GlassLion home. 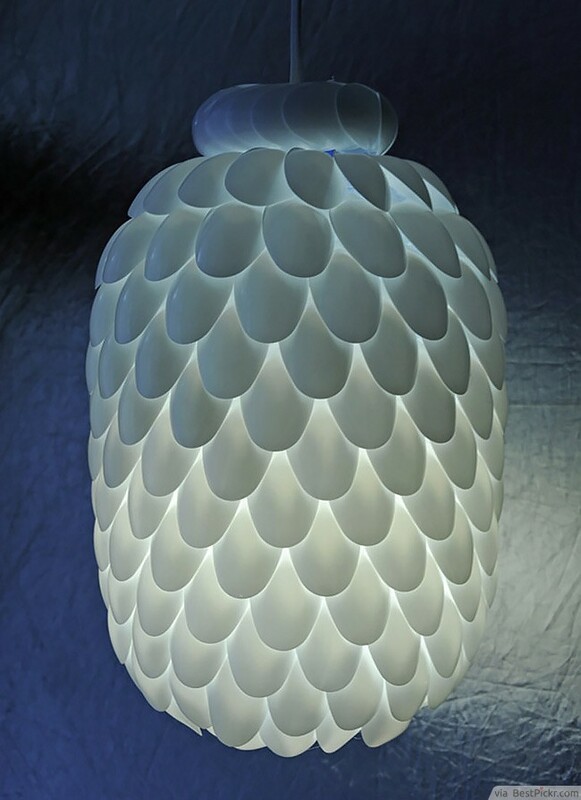 The entire range of these paper pendant lighting designs can be found at etsy.com. The lamp uses lots of vintage paper rosettes from newspapers, magazines and books. Each petal is hand cut and then put together into a wire structure that holds a warm yellow light bulb inside. The effect is a beautiful shimmering of light as it penetrates each petals and a cozy warm feel for any dining room or a half-open outdoor patio space. A perfect blend of vintage and modern outdoor lighting design.